Once you login to Congrea as a presenter, you will land to a page which will look exactly like the screenshot below. Once you click onto the settings icon a drop down menu will appear, this menu will have three different sections, bulk user action, general and media. The Bulk User Action section will have the options to enable/disable the audio and video access for learners i.e., you have the option to mute all audio and disable all videos of the learners. *For a Presenter these controls are available in selected features of Congrea such as, Whiteboard, Document sharing and during the Learner’s screen sharing. Click the whiteboard icon and use the application toolbar to select and draw the shapes as required. To replace, resize or realign any shape click the Active All option and select the shape or text you want to modify. Using the motion of your mouse, you can easily customize them. You can also use Active All button to select and delete any shape. To Upload a video already present in the system click on the Upload Video option present in the bottom left. Select the video you want to share and press open. You can also select multiple videos one by one. Click on the Poll icon from the applications panel and you will see two different options (course poll and site poll) present on the upper left section of the screen. Click course poll to run a poll related to the course running in the classroom. Click site poll to run a general poll. *Congrea along with other softwares (e.g. Moodle) allows you to run a quiz during a classroom session. This feature of Congrea allows the you to share high quality online HTML5 presentations just by using their URLs. Both the presenter and learner have the option of having common as well as private chat with any of the member present during the classroom session. You can simply click on the Chatroom option present on the bottom right of your screen to start a common chat. Whereas, for the private chat you can click on the name of the participant that you want to have a discussion with. 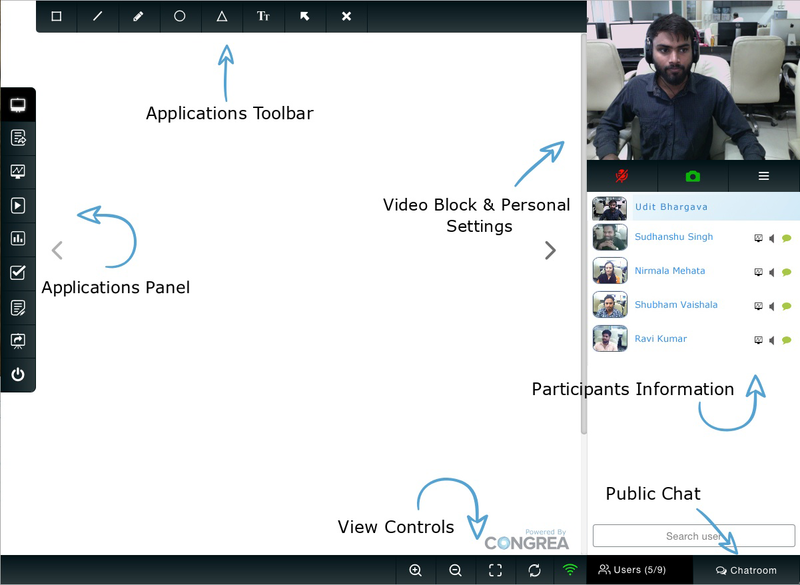 Here the presenter also have an authority to disable the chat of any of the participant/s just by clicking the option of disable chat present just beside the name of the participants. You can also have a basic audio visual interaction during the classroom session by enabling the microphone and camera by clicking on the respective icons. Once the classroom session is over you can click on the close session icon, the system will then ask your permission to Save the Session. Click on the save option to record the session and then press download. The recorded session will be saved in your own system and will be available for any further usage.